One of the best parts of my job is the ability to bring in engaging, thought-provoking, and inspiring speakers. 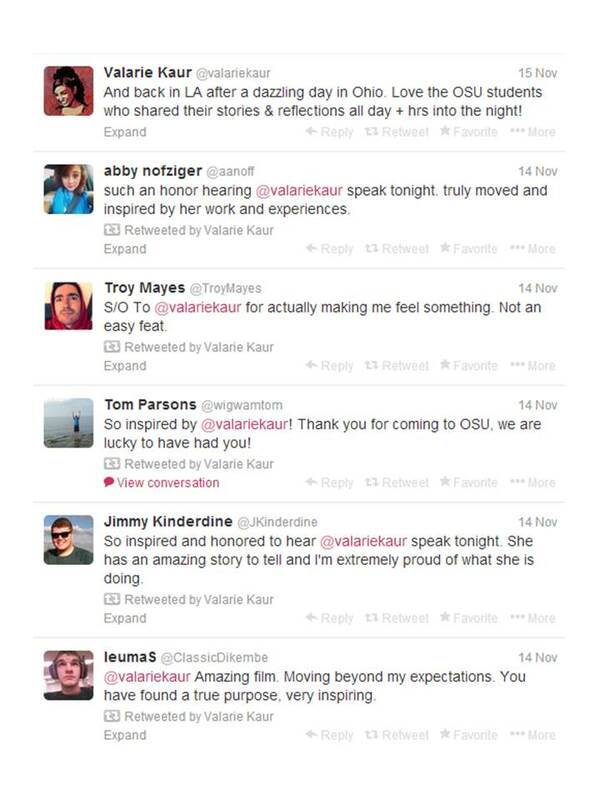 On November 14th, The Ohio State University welcomed filmmaker, civil rights advocate, and interfaith leader, Valarie Kaur to campus. There was a full day of activities planned, including a lunch, workshop, and dinner with staff and students, culminating with an evening screening of her 2006 documentary “Divided We Fall: Americans in the Aftermath,” which tells the story of her travels around the country documenting hate crimes post-9/11. must say I was unfamiliar with her and her work until introduced to me by a colleague last year. I tucked her name away in the back of my mind, but when the Buckeye Book selection was announced, tackling themes of a post-9/11 America, and I found out another organization on campus was planning on screening her documentary, it only seemed fitting that we also try and bring in Valarie, herself. There was excitement across campus for her visit. A number of groups co-sponsored her visit because her visit cut across a range of topics, including race, religion, culture, and social justice. Personally, I was even more excited after a healthy binge viewing of her appearances on the Melissa Harris-Perry show. For the workshop, Valarie introduced attendees to the the power of narrative and how it can be used to further social change. Marshall Ganz’ public narrative framework of thestory of self, the story of us, the story of now. All of the attendees participated by reflecting on their own personal stories and connecting them to broader meanings and implications. The workshop lasted two hours, but we could have easily spent more time on this topic which everyone enjoyed exploring. Have you ever felt that way? I’m sure many of us doing social justice work feel a similar sentiment from time to time. Whatever our visions of a more socially-just world looks like – whether it be in this case to see a contemporary piece simply become a reflection of the past (it is hard to wrap my head around 9/11 to have happened 13 years ago), or something else, when our hopes are not fully met, it can sometimes be overwhelming. Yet, we press on, encouraged by the fact that even those who are encountering our message for the first time have been changed for the better. In that sense, we are one step closer to realizing that vision for a more perfect world. To say it was a wonderful day would be an understatement. I can only hope we will be able to bring her back to OSU sooner rather than later!